I was broken-hearted and exhausted and shakily making my way through my divorce. That year, both my mother and my sister-in-law gave me dishes. Without consulting each other, they both chose blue glass, and chose to give me new dinnerware. Isn’t that amazing? an un-wedding present. Food and cooking had marked my life with my ex. He had (has) a big personality and liked entertaining, and most of our family gatherings centered either on his Sunday breakfasts or summer Sunday barbecues. 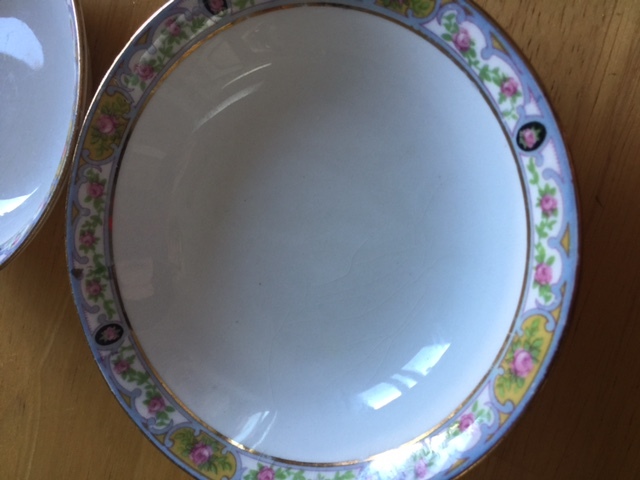 We had a set of white dishes, ordinary, but specific to that time–the china with silver around the edges, and a faint pattern of leaves. I got rid of them and installed my new blue dishes with the most enormous sense of relief. Even as I’ve gone through my most foodie period ever, I’ve kept them. (Blue does not display food well.) It’s probably a great gift for any woman–or man–getting divorced. As I took the blue plates, given with such intuitive intelligence all those years ago, I flashed on the antique saucers and bowls, all edged with roses and gold, that I used to collect from thrift shops when I was a starving college student. 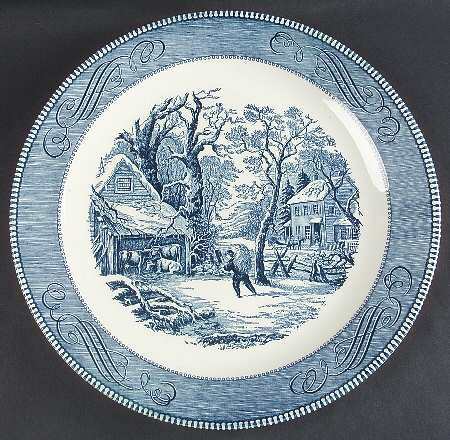 And then backward to my mother’s Currier and Ives set, the ubiquitous dinner plates of the 60s. She may still have a few remnants, but her dishes are bold and colorful now. A couple of years ago. I happened upon an old set of china, much like the old saucers I loved. They lacked dinner plates, but everything else was there–small dessert bowls, delicate cups, saucers, serving dishes, and the lot was only $25. I now use them for tea parties and special occasions, supplementing my blue glass plates with the brightness of the antique china, and I feel like the whole me, young woman and older one melded togeth er. The dishes we use are charged with powerful memories and emotions, a thousand meals and conversations, love and conflict, laughter and tears. I’ve been thinking about getting a new set of china lately, and that must be because I’m entering a new stage of my life. It will be fun to celebrate that with new dishes. What do you currently use? And do you have memories of other sets of dishes? Did you ever give away a set, like I did? One of the hardest things about starting a new book is the awfulness of it. Finally, there is real spring in the air. You can feel it burning off the cold by eight-thirty, and a brilliance of light makes everything stretch and awaken. My poppies are up, green and thick, and the daffodils—a bit scrawny so far—and the tulips, looking sturdy. I’m surprised by a crop of garlic that must be leftover from last year, and not at all sure that the wisteria that’s supposed to overwinter is actually going to do anything. In the meantime, I have a new experiment. I’m madly in love with a chubby Spanish pepper called pimento de padron. I must have had them in Spain when we walked the Camino, but it was later that I started to love them so madly—they’re often served as a tapas plate in Spanish restaurants, and prepared very simply, pan grilled in olive oil, sprinkled with coarse salt. That’s it, but every bite is heaven. They are mostly not very hot, but part of the pleasure is in finding the one in ten that has a bite—it explodes in your mouth, spice and heat and salt and oil, and it makes me laugh, every time. The thing is, we have peppers of every variety you can imagine here. I could buy habaneros and jalapenos and Anaheims (which we call Pueblo chiles here) and cayennes; I can grow all of those and more from bedding plants sold at the grocery store. Padrons are not common. I had to search hard to find a place that would ship me some last fall, and they were $17 a pound, plus shipping. Worth it, but at that price, not something I’d do very often. Naturally I decided to see if I could grow some. Logical, yes? Problem #1: getting the seeds. I did find some, and ordered from three sources, to see which ones grow best. Problem #2: peppers need a long growing season, which I do not have. They also need a very hot bed to germinate, and my greenhouse is not heated. This was not the easiest challenge. I bought some heated mats, but they said they kept the temperatures of the soil about 10-15 degrees higher than the room. Not really enough. I fretted and considered one solution after another. I bought a space heater, but when it arrived I realized that even if I hung it from the rafters of the greenhouse (not ideal), I’d worry about it melting the walls. I put it aside for my real greenhouse (which I vow to you I will have by this summer’s end) and went back to brainstorming and combing the web. Turns out, many people use jugs of water, painted black, but I didn’t have time for that. Another solution is oil heaters, which I happened to have in the basement. I lugged it outside, but it was too tall for the spot it needed to go, and the slope was too much for it to stay stable—another bust. I finally decided that maybe I was putting too much effort into what is, after all, an experiment with seeds, a little hobby play. Keep things in perspective, I said. Let’s just see what happens. I planted the seeds, along with some celery. 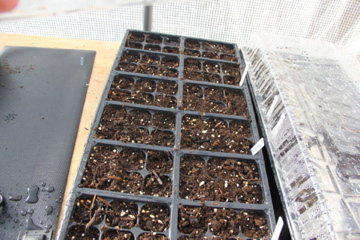 One of the leaflets in the padron seeds suggested putting a ¼ inch of water in the bottom of the trays to help conduct heat, so I did. 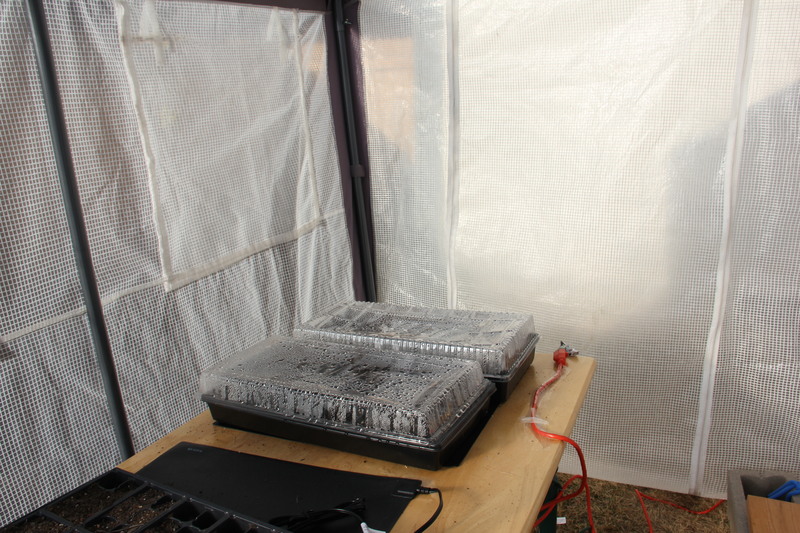 I also made a special trip to Lowe’s to find seedling greenhouse covers, to help keep the heat and water in. I tucked some potato starts in a black potato bag and put it on the south end, by the tables, hoping it would hold and conduct heat, too. Then I closed everything up and waited for the storm. (Oh, I didn’t mention that? Yes, a storm came through over the weekend and dropped the temperatures to below freezing.) The cats slithered in below the plastic and slept in there, so I figured it had to be sort of warm. By the time the storm passed, I’d stealed myself to find everything inside frozen—but when I opened the window flap to peek in, a rush of warm—not hot, but definitely warm—air poofed out. Everything was fine! Nothing is sprouting yet, but I’ll keep you posted. 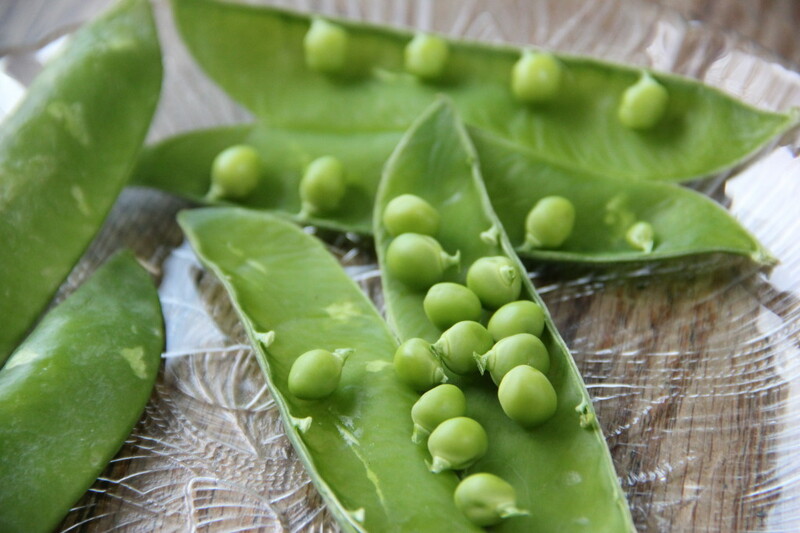 Christopher Robin loves fresh peas with a passion he usually reserves for milk chocolate. He will eat a solid pound of them, steamed and salted and buttered. I enjoy the meditative aspect of shelling them, sliding open the pod, pulling a string, skimming out the contents of the cold jackets. He also added them to store-bought chicken soup. I ate a lot of them before they even made it to the steamer. What I noticed this time is that the peas look very like Shrek’s ears. Do you suppose they might have provided inspiration for the artist who conceived the ogre? And we’re ready to go. The cats have been camping on my suitcase, and Jack is following me around everywhere. The long, long list of Get Ready for Christmas, Have Christmas, Go to New Zealand Two Days Later List is pretty much all checked off. Despite the sad fact that my eldest was felled by food poisoning over the weekend, we had a great visit, and I especially loved Christmas breakfast, which involved orange-frosted cinnamon rolls, both vegan and Pillsbury, and bacon, both regular and tempeh. Place the tempeh in a glass dish and pour the maple syrup over it. Add soy sauce to cover. Cover and marinate in the fridge for one hour to overnight. Heat canola oil or other high heat oil over medium heat and add the tempeh slices carefully, turning often. They burn quickly! It takes a little practice to get just the right caramelization on the slices, but it just takes tending. Serve. Next post will be from NZ….stay tuned. This morning, as we finished our in-bed cup of tea, which we take turns making and bringing back upstairs, I realized I had a wish for grapefruit juice. 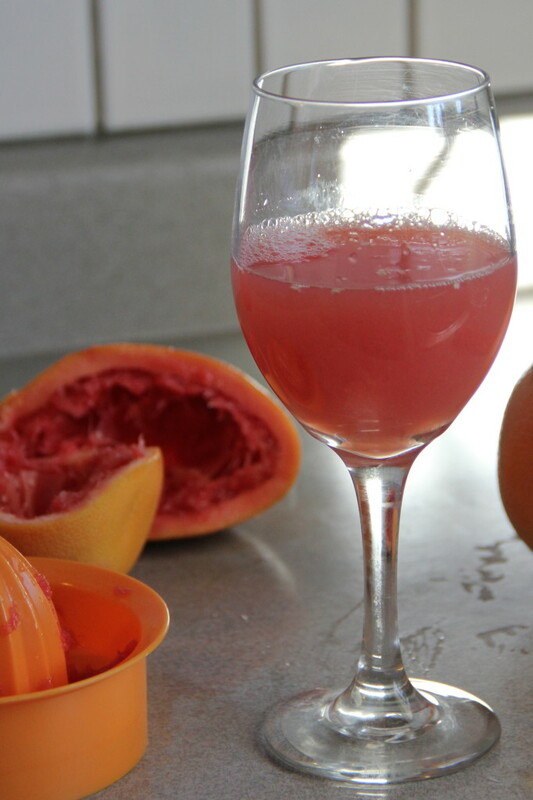 When we were in DC to see my son, I had fresh squeezed ruby red grapefruit juice every day at Founding Farmers and it stuck with me. Why, I wondered, didn’t I make this treat for myself at home? But I never got around to getting a juicer. This morning, recovering from the extreme press to the end of the MIP, I’m trying to listen carefully to my poor body. It said, grapefruit juice. Please. Please please please please. I said to CR, “Let’s go out to breakfast at the Egg and I.” He agreed. Unfortunately, the delivery truck was late and there was no grapefruit juice. We had a nice breakfast anyway, but I was still feeling that craving, that very specific, needthisnow feeling. On the way home, we stopped at Whole Foods and picked up some grapefruits. Also, bonus: fresh figs, which I desperately wanted a few weeks ago and there were none to be found. Trouble was, they had no juicers at WF. Not even the little plastic ones. We searched high and low, but they were not in stock. I was prepared to just use the food processor, but now CR was on a quest, so we headed over to Target, which had only just opened, and viola! There were juicers of every variety, from the $4.99 basic with a nice glass jar, up to a $99 model which will do everything but buy the fruit & veggies for you. (I actually do want a juicer of that sort, but I’m not into spending that much money on a whim). I choose the basic model and we headed home. Where I made my own freshly squeezed grapefruit juice. 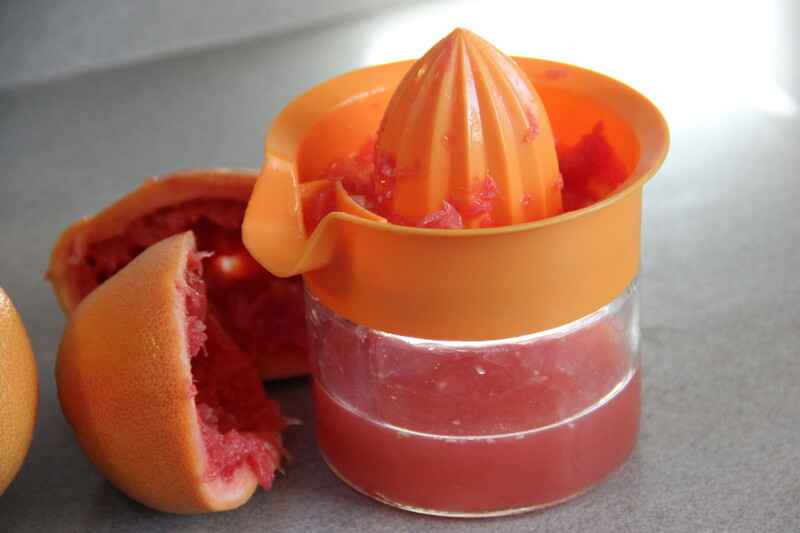 Isn’t this a cute little juicer? Takes all of two minutes. It was exactly, exactly, what my poor battered body wanted. Don’t you want some, too? 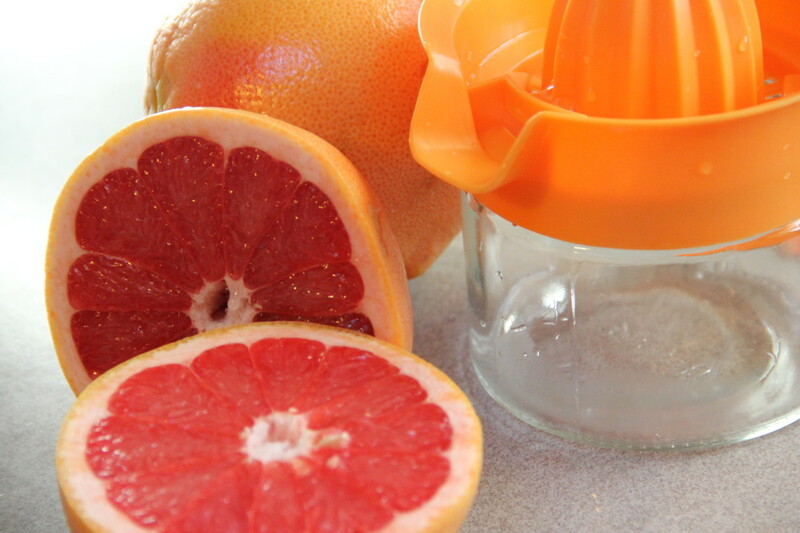 And now I have a juicer, and a stash of grapefruits and shall make more juice whenever I like! La. Before I forget: Amazon included In the Midnight Rain in an October special, so it’s .99 for the whole month. If you haven’t read it, now is a good time to grab it. It’s a slightly overcast morning, and promises to be truly cold and blustery and maybe even snowy tomorrow. I had the house cleaned thoroughly yesterday—it feels so good to have the house all in order, and the floors cleaned and the bathrooms sparkling. I love, love, love that. Once, it would have made me feel guilty. Now I think about how the young woman who cleans my house has a job and I get a clean house. Good trade. We had our first freeze on Wednesday night, and all the tomato plants fell over, despite my (half-hearted) attempts to save them with tarps. 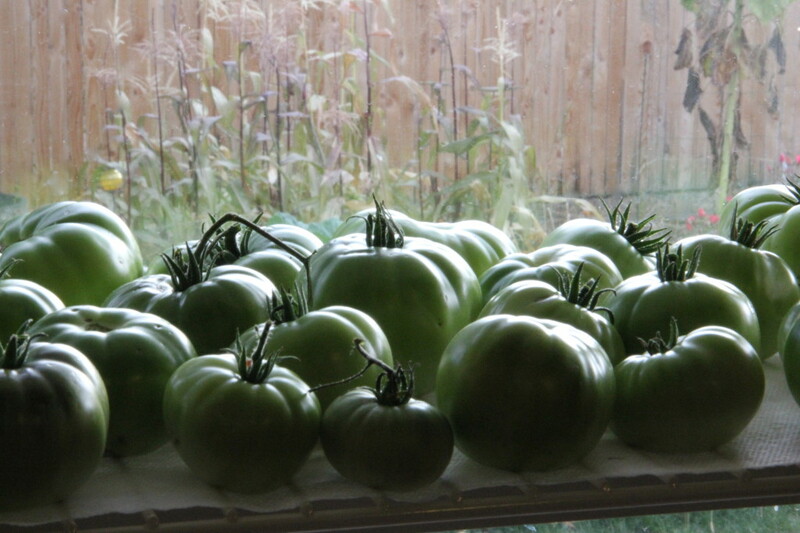 I had to collect them all, about 20-25 pounds of green beefsteak and roma tomatoes of many sizes. I took bags of them to each of my neighbors, and this morning put the rest on the top shelf of the greenhouse window. They looked so beautiful that I had to run and get my camera to shoot them, finding in me that quiet, that peacefulness that comes to me through the lens of a camera for no reason I can pinpoint. Maybe it’s the focus, the wordlessness of letting everything go to be in the moment, here, right now. Maybe it’s the sweetness of beauty, because I do tend to shoot things I think are beautiful. Some photographers collect gritty or grim or ugly things, but I’ve never been that person. I love beauty, and flowers and fruits and vegetables, and looking at things closely. I love the corn in the background, the way the light spills over the silken curves of the tomatoes, the way their shapes are repeated over and over, and the stems add prickliness. Garden/kitchen tip: green tomatoes will keep for a long time this way. Spread a paper towel over a flat window sill and put the tomatoes on top. The last time I did this, I had tomatoes through Christmas. So that’s what I’m going to do. I’m going to stop burdening this poor book with more and more and more expectations and weighing it down with lead bricks of time pressure and twisting and turning and all that other business- and expectation-crap and just let the story emerge as it wishes. I like these characters! I love them, honestly. Lavender and Ruby and Ginny and Noah and the little barn cat and the lavender fields and the chickens. It’s lovely and sweet and I’m just going to go write now. What are you up to this weekend? Is it freezing where you are? 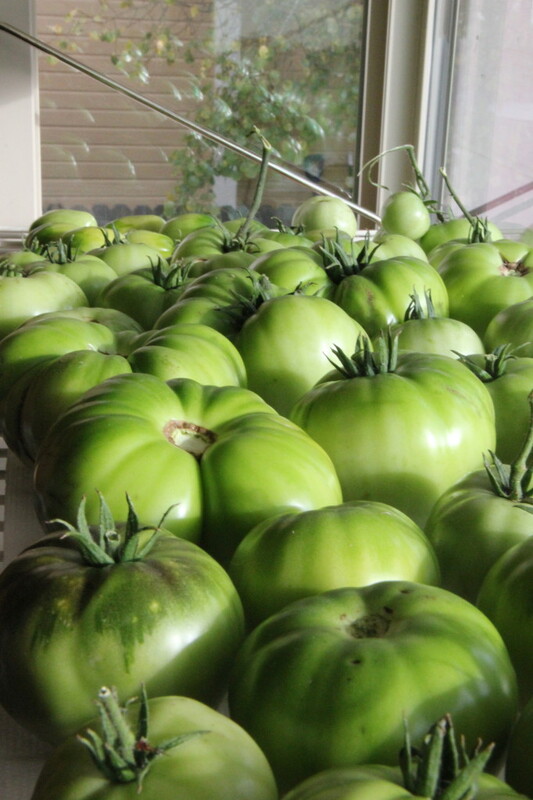 Do you know any recipes for green tomatoes? Did Joan wash her hands at the same sink? I am making potato salad this morning, from a cookbook that is so tattered and well-used that I have to rubberband it together to keep all the pages in. The cookbook is one I’ve mentioned here before, Spoonbread and Strawberry Wine, given to me by my grandmother when I married (my now-ex) thirty years ago. Her handwriting on the fly leaf is fading, but visible, and I feel her with me when I cook. In fact, this morning as I assemble the ingredients for what really is one of the BEST potato salads of all time, I’m suddenly and inexplicable transported to a day that must well over a decade ago. My grandmother and my mother-in-law, whom we all called Mama sat in my blue-painted dining room together. They had not had much time to chat before, though I knew how alike they were—both devoted to God, both beauties. That afternoon, they were both quite well-dressed in the way of Southern Women, wearing skirts and good jewelry, their hair nicely done. One white, one black, both of them exquisitely beautiful, even at their advanced ages. They sat spoiling Sasha the terrible terrier who charmed every old woman in that room and then spent the evening farting pungently and snoring in pure happiness from all the tidbits they fed her. Why do I remember that day, in particular? I must have made this potato salad fifty times, a hundred. But this is the day that rises up, whole and shimmering. The sun shone through the lace curtains and music was playing from the kitchen and I was making potato salad with Fern, Mama’s sister. (My memory stutters suddenly—was it Fern? Or Vivian? Which sisters came with her? I narrow in on that kitchen I so loved, with two windows, and that day sun was shining through the elm leaves. Fern, so tidy and smaller than the others. Yes, that’s who it was. She taught me to how to boil the potatoes whole, then let them cool so the peeling is easier. I don’t remember the reason for the gathering—was it an anniversary? Someone’s birthday? Why did Mama and her sister come all the way to Colorado? It was the only time they made the trip. The reason escapes me. I don’t remember who else was there. Only Mama and my grandmother and Sasha and Fern. I see their laughing faces. I see Sasha begging with her fu Manchu beard and bright eyes—a dog who lived sixteen years and it wasn’t quite enough still. I have the sense that I knew my marriage was doomed already, that there had already been a lot of trouble, but my husband was there, too, barbequing maybe. Almost certainly in charge of the music. 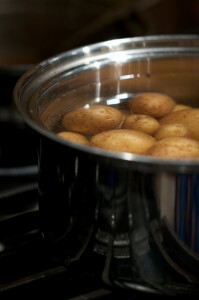 Today, my potatoes are ready and I set them in the sink and run cold water over them. The potato salad today is for my nephew, home for a couple of weeks after joining the Navy. I wonder how it will all look to him now, after eight months away. My parents will be there, and I’ll bring my granddaughter back home with me, to sleep over so her parents can go to the fair. Will I remember this day, a decade from now when I make this recipe? Who knows? Not me. What I do know is that the potato salad is delicious, that Mama and Grandma would be thrilled with my grandmotherness—and my darling Amara– now, and that Fern would be pleased to know that I remember her showing me that trick. Recipes are tradition and love and the very ordinariness of repetition. I hope you’re cooking—or eating–something today that makes you remember people you love. Do you have a dish that conjures up memories of people you love, or a day you like to remember? 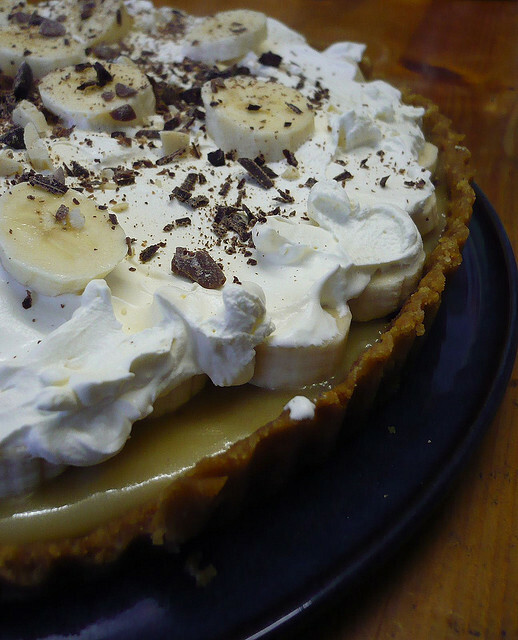 I’ve been posting a lot at Facebook about my younger son’s love of Banoffee Pie. I made one for Thanksgiving, and there is never even a crumb left over. It is one of the most luscious, decadent pies I’ve ever tasted. Don’t worry if you have not heard of it. My first encounter was only a few years ago, at a gathering at Christopher Robin’s mother’s house in Hawkhurst, a village south of London. Gina had cooked a true English Sunday dinner of roast beef and Yorkshire pudding and swedes (rutabagas). Banoffee pie was dessert. Or rather, pudding. Even though it’s pie. Whatever you call it, I took one bite and swooned. A crumbly, buttery crust. Caramel layered with bananas. Then unsweetened whipped cream dusted ever so slightly with cocoa powder. Sweet, rich, fantastic. I’ve started making it for holidays, and my younger son went so crazy for it that it’s the only dessert I ever make for him. The trouble is that it uses ingredients that are not always that easy to find in the US. Like canned caramelized sweetened condensed milk. And digestive biscuits. Gina regularly sends me tins of the caramel, along with teabags and pastilles, but since I have a lot of US readers, perhaps you’ll want a source here. Alarminly, some recipes call for boiling tins of sweetened condensed milk in hot water until they caramelize, but I do not recommend that. The possibilities of exploding tins are horrific to contemplate. Paula Dean has a method for caramelizing milk in the oven you may want to try. But really, you should be able to find Carnation dulce de leche at the grocery store with the condensed milks. It is available here in Colorado as a Mexican ingredient, so you might try that aisle, too. Another problem is the digestive biscuits. I can buy them from the local English store (or your local world market), but they’re very expensive and often stale, so I’ve been trying substitutes. Dean’s recipe uses graham crackers, which I’ve tried, but that’s not quite the right flavor. This Thanksgiving, I tried mixing ordinary, mildly sweet sugar cookies with graham crackers ½ & ½ and we all gave it two thumbs up. The third challenge is the UK to US measuring issue. They use ounces and grams, and the ounces are not the same. Very confusing, especially if you are (like me) not inclined to deal with fractions. I have finally found a cheat sheet that works well, but I’ve done the work for you here so you don’t have to bother. *One funny side note. According to Wikipedia, banoffee pie is enormously popular on the backpacker route in India. Anyway, here is the recipe. Do let me know if you try it. Gina will be so pleased. 1. Mix together the butter and crumbs, the press evenly into a 9-inch pie pan. 2. Cover the crumbs with caramel, then slice the bananas on top. 3. Whip the cream until it forms stiff peaks, and spread over the top of the bananas. 4. Arrange sliced bananas on top of cream. Dust lightly with cocoa powder or shaved chocolate. 5. Chill for at least an hour. Don’t expect leftovers. This morning’s post to The Lipstick Chronicles. What household jobs or areas are repugnant to you? I have an old stove—a dull cream model with ancient electric rings and a black front. It’s serviceable, but little more than that. I hate it when the sun comes streaming through my kitchen window and illuminates the splatters of grease across the control panel and the aged dust stuck to the inner hood. I’m sure I must have wiped it all down when I cleaned the kitchen last night, but it looks like something out of a hoarder’s episode. Dust from the wings of cat-murdered miller-moths mixed with flutters of dog fur mixed with kosher salt mixed with that creeping cooking sludge I can never quite identify.